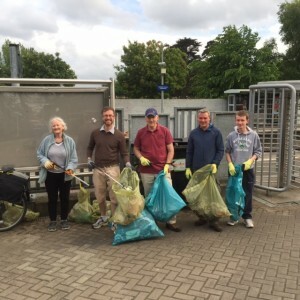 I want to thank all the volunteers who were out with us this evening for our Annual Royal Canal Clean-Up. We worked a stretch of the Canal between the 12th Lock and Coolmine Train Station, picking up cans, glass, plastic bottles and other rubbish. We got a significant amount of waste collected, which Fingal County Council is now going to dispose of. The Royal Canal continues to be a significant amenity for Dublin 15 residents and a potential tourist attraction for visitors interested in walking or cycling holidays. In the context of the new Fingal County Development Plan, I’m going to continue to work to ensure that it is protected for everyone’s enjoyment.